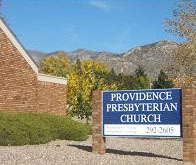 Providence Presbyterian Church in Albuquerque, New Mexico strives to exist and minister to the glory of God our Redeemer. We began in the Fall of 1984 as a mission church of the Presbyterian Church in America with which we maintain an affiliation. This is the denomination of Dr. R. C. Sproul, the late Dr. D. James Kennedy and the late Dr. James Montgomery Boice. We seek to have the Bible as the foundation for all we do, recognizing it to be the authoritative, inspired word of God Himself. We view the worship of God as our holiest privilege and evangelizing the lost as our greatest duty. We desire to glorify the Lord through our obedience and to enjoy Him forever based on the finished work of Jesus Christ.